People often think that because I can’t consume gluten; I’m living this sad and miserable life. While I will admit, pasta and bread will never be the same ever again, it really isn’t THAT bad. AND lots of places are now jumping on the #glutenfree bandwagon and accommodating to us allergy stricken people. I remember the days I would go into trader joe’s and struggle to find anything gluten free, now they have a whole aisle!! (kudos to you, TJ’s) and it’s not just stale crumbly bread, THEY HAVE BROWNIES AND BAGELS AND COOKIES!! (eeeeeek) While I am more of a salty over sweet kinda girl, who doesn’t enjoy a dessert??? and one that they can eat without feeling like they might keel over?? Even better! TJ’s Joe-Joe’s: I don’t have that euphoric feeling that oreo’s are sent from God like a lot of people do, but damn these are good. definitely not crumbly, and definitely addicting. TJ’s Chocolate Chip Brownies: These are brand new, at least to my store, and wow they are really freaking tasty. extremely soft on the inside and a little crunch on the outside, like any good brownie should be! TJ’s Chocolate Cupcakes w/ Buttercream Frosting: I’m aware these aren’t pictured, but these are my go to when I’m feeling a dessert, but beware they are extremely rich!! **Whether you’re celiac, intolerant, or just sensitive, eating doesn’t have to be hard—you just have to find the right place to go!! Love you forever TJ’s! 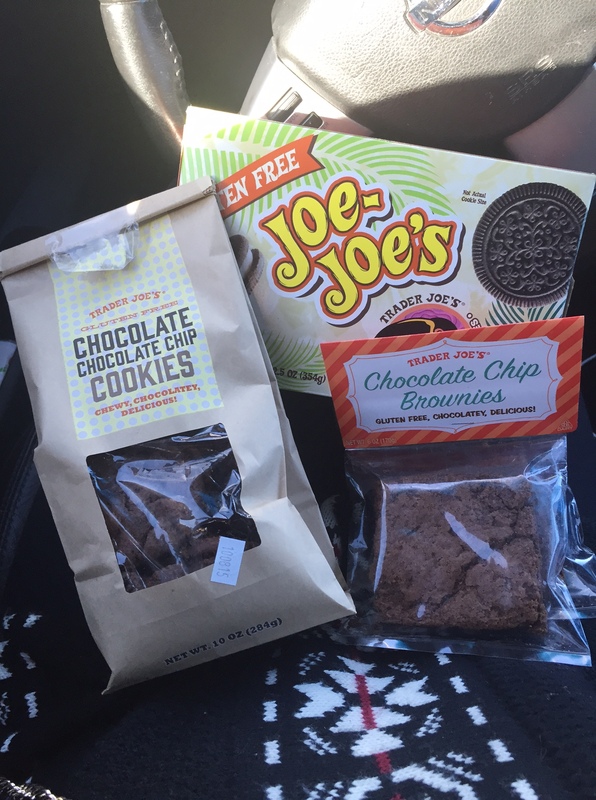 Looking for a full and complete list of TJ’s gluten free options? Click HERE!